Posted Nov 27, 2018 by Eds. On Oct. 28, far-right leader Jair Bolsonaro was elected President of Brazil after a bitterly fought runoff against left-wing Fernando Haddad. Throughout the contest, WhatsApp played a major role in political campaigning and the spread of fake news. Earlier in October, a Brazilian newspaper reported that (paywall, link in Portuguese) businessmen had illegally bankrolled a campaign to buy mass-messaging packages to spread pro-Bolsonaro content. WhatsApp uses end-to-end encryption, which means even the company is unable to see or track content. Some have called for the app to break its encryption to track misinformation or to restrict malicious content. In India, for instance, the company has imposed a five-recipient limit on the number of times a message can be forwarded. There have been calls for similar measures in Brazil, but nothing has been rolled out, leading to further criticism that WhatsApp did not devote enough resources to tackle misinformation ahead of the election. David Nemer is a professor in information communication technology at the University of Kentucky, whose book Favela Digital examines the effect of mobile technology on Brazilian society. In an email interview with Quartz, he outlined what happened in Brazil and what would be necessary to avoid a similar situation in India. In an article for The Guardian, you described how you joined several political WhatsApp groups ahead of the election. What was that like? I joined four pro-Bolsonaro WhatsApp groups, each of which had around 180 members and saw 1,000 messages per day. The groups didn’t see much meaningful debate. Instead, they seemed to serve as motivational spaces for Bolsonaro supporters who wanted their beliefs affirmed. Members also used these groups to verify the information they received from the mainstream media, other social media platforms, and other WhatsApp groups. If the information posted went against Bolsonaro, other members would jump in quickly to delegitimise the content. The conversations were fast-paced, lasting around 10 to 45 seconds. A topic would emerge based on someone’s message and several people would jump in to respond, often with messages celebrating Bolsonaro with hashtags or emojis. I was also surprised by the amount of media shared in these groups, from poorly designed memes to sophisticated edited videos. Can you describe some of the fake news on these WhatsApp groups? I’m still analysing the 500,000 messages I have collected, but so far, I’ve noticed that in every 10 messages, two or three could be identified as disinformation. During the runoff of this past election, it was possible to see fake news benefitting both candidates, Haddad and Bolsonaro, but according to a study of the 123 instances of disinformation found by fact-checking agencies, 104 benefitted Bolsonaro. One prime example of pro-Bolsonaro fake news was the story that his opponent, Haddad, had ordered the distribution of “gay kits” to schoolchildren to turn them homosexual. This was a reference to an actual proposal by Haddad’s Workers’ Party to launch a “Brazil without homophobia” programme in schools, part of which involved distributing anti-discrimination materials to teachers. On the pro-Haddad side, there was an image circulated of a testimonial signed by a so-called “Reuters’ Director of Journalism,” claiming that Bolsonaro had colluded with his doctors and son to stage the knife attack that happened to him in September, in order to garner sympathy. Did politicians in this election use other social media platforms too? They also turned to Facebook to reach out to the electorate. But Facebook was not as efficient as WhatsApp since the campaign ads were expensive and the electorate didn’t share or forward them as much as they would do it organically—and for free—on WhatsApp. 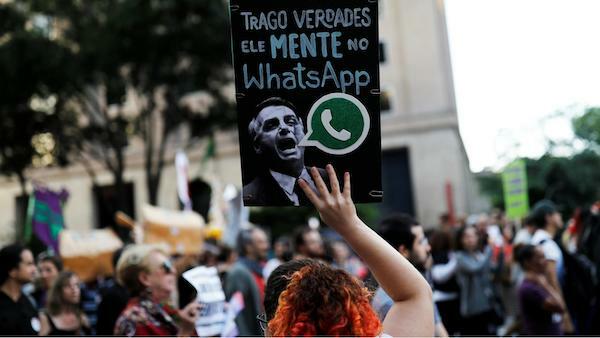 How pervasive was WhatsApp before this election cycle in Brazilian politics? WhatsApp has been popular in Brazil since it entered the market in 2009. It was very cheap in comparison to SMS, which could sometimes cost around 55 times the amount charged for it in North America. Currently, there are around 120 million active WhatsApp users in Brazil, out of a total population of 210 million. About 96% of Brazilians with access to a smartphone use WhatsApp as one of their main methods of communication. What responsibility do you think WhatsApp, as a company, should bear for the dissemination of misinformation, and should they take measures to stop it? A group of Brazilian researchers called for WhatsApp to institute the Indian forwarding limit of five messages per forward in Brazil (as opposed to the customary 20) to cut down on the false news during the campaign. WhatsApp declined to do so. While this could be a solution, it is not optimal because it also limits our ability to communicate and could inhibit our freedom of expression. Another thing the company could do is improve its efforts to detect suspicious activities on the platform, like the marketing firms that bombard users with their content. WhatsApp could ban these users from their platform and seek legal action against them. But it is important to say that during the 2010 elections in Brazil, misinformation was spread on blogs and Orkut; in 2014, it was spread mainly on Facebook; in 2018 WhatsApp was the tool of choice, and in 2022 it will almost certainly be a different technology. So it is not very effective to limit and control a specific technology, because it is likely that it will become obsolete in the next cycle of elections. Therefore, in my view, the solution to this problem is more related to legal and social measures rather than technological issues. What measures did the Brazilian government take? What more could they have done? The supreme electoral court tried to forbid the circulation of misinformation, but their process of adjudicating whether something qualified as such simply couldn’t keep up with the speed of fake-news generation. The court was also not very effective given that they were not able to go after those on WhatsApp who were creating and sharing the messages; they were only able to punish candidates if they were to endorse them in public. I still believe the way to circumvent the issue of producing and sharing fake news is to improve and build agile mechanisms in the judiciary system in order to identify and punish those responsible for such actions. With punctual and exemplary punishments, as well as educational programmes about fake news, I believe we can mitigate their consequences. What do you think should be done in India to try and prevent the 2019 election from being as influenced by WhatsApp? The electoral courts should be ready to act quickly. The government should start massive educational programmes about fake news, as well as invest in digital literacy programmes.